Sabrina, a deaf student from Greta Home and Academy in Haiti, was all smiles during her visit to Washington, D.C. She was in the United States to receive hearing aids. A Greta Home and Academy teen receives a life-changing gift from friends. Sabrina’s eyes darted back and forth between the audiologist demonstrating how to use the tiny apparatus and the interpreter who was relaying instructions via sign language. Encouraged by their reassuring smiles, she practiced inserting and removing the hearing aids. After a few calibration tests, the doctor asked her the question she had dreamed about countless times during the past 13 years. “Can you hear me now?” the doctor prompted. The teenager’s reaction was not immediate. There was no “aha” Hollywood-movie moment. Instead, Sabrina seemed to concentrate intently on what she was hearing—possibly bits of indistinguishable sounds she was experiencing for the first time. Several seconds passed before a smile formed on Sabrina’s face. She listened for more sounds in the crowded examining room, where excited friends suggested someone play music for her on an iPod. Dr. Mary Markovich, an audiologist with Blue Ridge Ear, Nose, and Throat, Inc., in Boone, shows Sabrina how to insert her new hearing aids. “Celine Dion is popular in Haiti,” one said. “Maybe Sabrina would like to hear Taylor Swift,” posed another. It was the song “La Macarena” that did the trick. “I like it,” she signed to the interpreter, as she delighted onlookers by breaking into some nifty dance moves with her hands. First sounds, first songs, first steps—all ushering Sabrina into the noisy but exhilarating world of the hearing. Don’t worry about this courageous young lady. She’s eager for the challenge. The journey has not been easy. Sabrina is used to confronting life’s hardships, and deafness was not her biggest hurdle. Like many of the children who come to the Greta Home and Academy in Haiti, Sabrina’s family lived in grinding poverty and had no means to take care of her. A sympathetic aunt took Sabrina in, even though she had inadequate resources to provide for her own two children. Seeing no other recourse, the aunt eventually brought Sabrina and her cousins to the Greta Home, a project of Samaritan’s Purse. Of the 62 full-time residents, Sabrina is the only child who is hearing-impaired. Samaritan’s Purse sent her to a special school in Port-au-Prince, where she learned sign language and gained self-confidence. This year she is attending a school for the deaf in Leogane that enables her to commute daily from the children’s home. Greta Van Susteren and her husband, John Coale, spearheaded efforts to bring Sabrina to the United States for hearing assessments. Van Susteren suggested Sabrina be brought to the United States for hearing evaluations to determine if hearing aids or cochlear implants could make a difference. As it turned out, the process of getting Sabrina to America was no simple matter. Her biological mother had to grant permission, passports and visas needed to be obtained, and other government approvals made the months drag on. Finally, in mid-September, the excited teen was on a plane with Samaritan’s Purse staff, heading to our headquarters in Boone, North Carolina. Making a dream come true requires teamwork, and Sabrina had an army of friends praying and contributing their time and talents on her behalf. Van Susteren covered Sabrina’s airfare. Blue Ridge Ear, Nose, and Throat, Inc., in Boone waived costs for doctors’ services and the hearing aids. And Liz Derrick, a local resident who has been involved in deaf ministry to children and adults for nearly four decades, welcomed Sabrina into her home. The next two weeks became a whirlwind of new experiences. Sabrina and her chaperones took a trip to Washington, D.C. to visit Van Susteren. 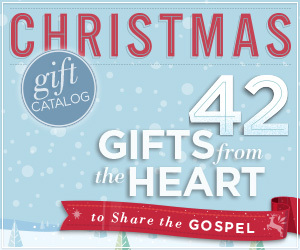 She was introduced to the Samaritan’s Purse staff during morning devotions. Best of all, the teenager reveled in going shopping, seeing a movie in the theater, hiking along the Blue Ridge Parkway, and learning how to cook pancakes and French toast. Liz Derrick, a retired teacher who has ministered to hundreds of hearing-impaired children and adults, jumped at the opportunity to be Sabrina’s host mom during her visit to Boone. Dr. Charles Ford of Blue Ridge Ear, Nose, and Throat, Inc., in Boone congratulates Sabrina, while Liz Derrick, her “host mom” in North Carolina, interprets in sign language. She has led the deaf ministry at their church in Boone for 35 years, serving as an interpreter and teaching Sunday school. Her late husband Buck, who passed away in 2014, served six terms as the physician for the U.S. team at the Deaflympics. The couple also adopted two profoundly deaf children whose condition could not be remedied by hearing devices. Joel Marc was 22 months old. Joy, an orphan from South Korea, was 13. Liz and Buck encouraged their own hearing-impaired children to view disabilities as opportunities, not limitations. Liz recalled one time Joel Marc was given a writing assignment at school in which he was asked to compose an essay describing his handicap. 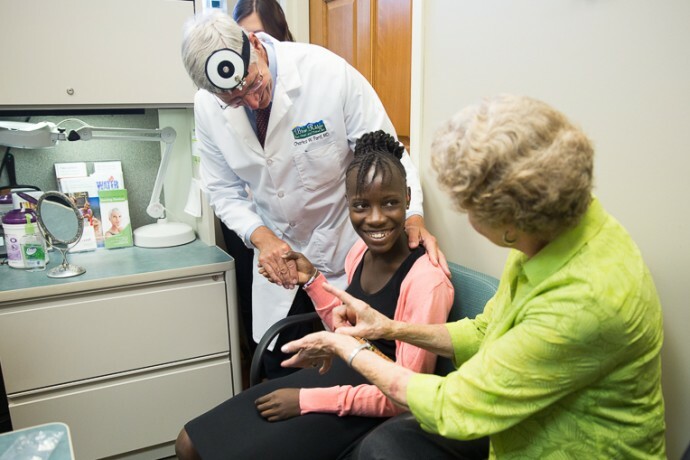 Dr. Mary Markovich of Blue Ridge Ear, Nose, and Throat, Inc., praised her young patient, who has made steady progress since receiving the hearing aids. Within a couple of weeks or less she should be able to recognize the most commonly heard sounds. Liz and Jessica have been teaching Sabrina to identify sounds—human voices, a car engine, the banging of a pot, and Sabrina’s favorite, music. It’s quite an adjustment for a child who was born with a 90 percent hearing loss. The roar of motorcycles still startles her. “For a deaf person, their eyes have always served as their ears. Sabrina is very smart, and she is learning to localize sounds with the hearing aids, but it will take time,” Liz explained. Sabrina signed “I love you” to Samaritan’s Purse staff during morning devotions Sept. 24. 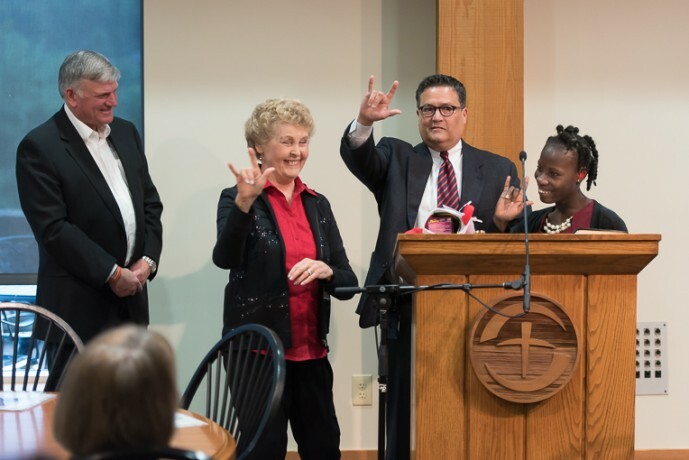 She is joined by Franklin Graham; Liz Derrick, a sign language interpreter; and Tony Cortes, the director of Child Safety and Development at Samaritan’s Purse. During her visit to the Samaritan’s Purse headquarters Sept. 24, Sabrina expressed her gratitude, signing “thank you” to everyone who has played a part in making her dream come true. Armed with her hearing aids, a stockpile of batteries, and two unforgettable weeks in the United States, Sabrina headed back to Haiti Friday with a fresh awareness of the world and its endless possibilities.